TÁNAISTE EAMON GILMORE has refused to confirm reports that the soon-to-be introduced property tax will cost the average homeowner between €200 and €400 a year. 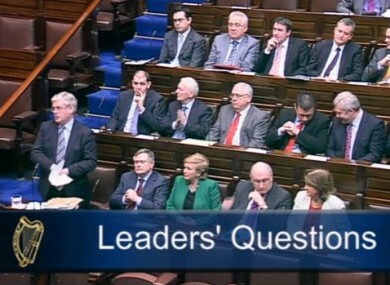 During a rowdy Leaders’ Questions in the Dáil this morning, the Labour leader dismissed questions from Mary Lou McDonald about the new tax and said that all information about it will be revealed on Budget Day. The Sinn Féin TD had accused the government of leaking details of the property tax to a national newspaper. The Irish Independent this morning reported that the property tax will be a flat-rate tax when it is introduced early next year and will be based on the market value of the house. The report suggests that homeowners will pay a rate depending on which band their home falls into each, with each band increasing by €50,000. A house worth €235,000 would pay an estimated €500 a year. However the Tánaiste said the issue is a “budgetary matter” which is currently under consideration by the government and Minister for Finance, and would not be drawn in on the details. Gilmore also criticised Sinn Féin for what he described as the party’s “hypocrisy” over property tax. He recited figures to the Dáil detailing how much property tax average homes in Northern Ireland pay ever year, ranging from £506 for a house worth £75,000 in Coleraine to £1,100 for a house worth £150,000 in Antry. “Does the hypocrisy of Sinn Féin know any bounds at all?” Gilmore asked, to loud heckling of Sinn Féin from the government benches. McDonald described the government’s approach as “straight out of Fianna F’áil’s four year plan” and said the government coalition is “continuing to implement their [FF's] austerity plan”. She called the plan to tax family homes a “crazy policy”. Gilmore did not answer a question about whether a waiver for the tax would be available for people on low incomes but said that the Budget, which will be delivered next Wednesday, will be “fair and balanced”. Email “Gilmore refuses to confirm property tax rumours”. Feedback on “Gilmore refuses to confirm property tax rumours”.